This post has been sponsored by Silver Spring Foods. All opinions and recipe are my own. When it comes to heat, I will always choose horseradish over spicy peppers. Horseradish brings a heat that you feel all the way to your nose, unlike the mouth and lip burning spicy chiles! 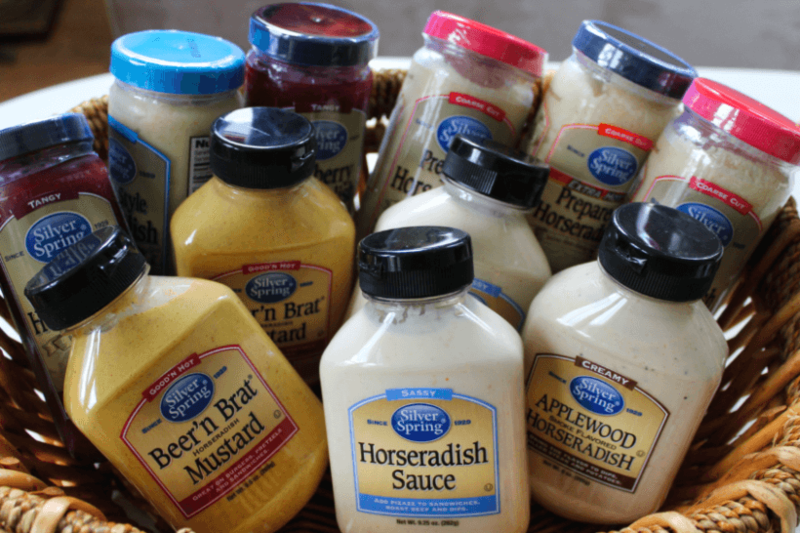 I recently received a shipment of horseradish and horseradish sauces from Silver Spring Foods— the largest grower and processor of horseradish in the U.S. (and it’s family-owned and operated!). Make sure you head over to the This Real Mom Facebook page to comment and you could win a basket of Silver Spring Food products for yourself! 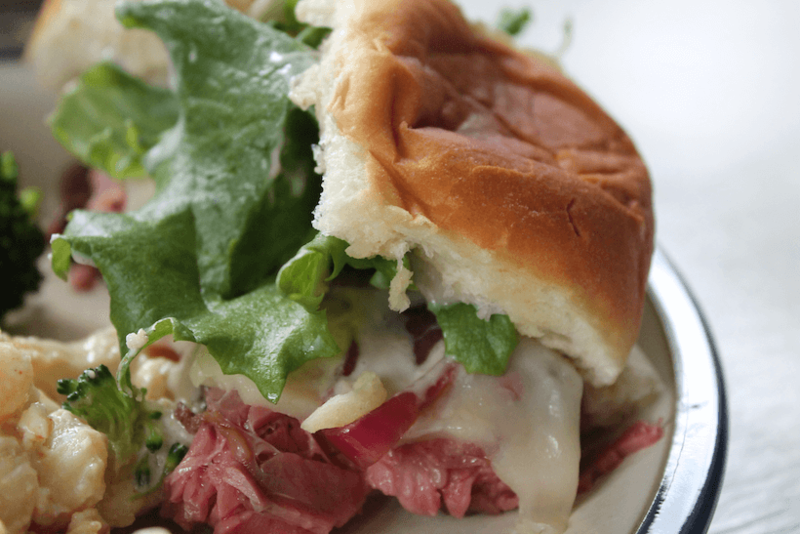 Horseradish and roast beef are a match made in heaven and since it’s still football season, I decided to create an easy-to-make ahead tailgate dish. As a busy mom of 3, any dish that I can prep and cook ahead is a winner in my book! These steak and cheese sliders are perfect for entertaining and great for parties too! If you want to save even more time and not have to worry about bringing home a plate, you can use a disposable aluminum 9 x 13 pan as I did! These sliders literally couldn’t be easier to make unless they made themselves and you’ll only need a few things from the store. 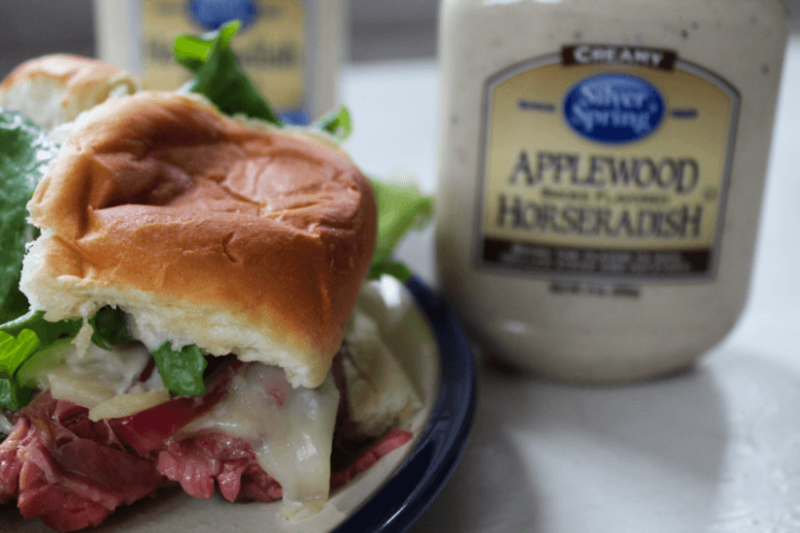 I chose to use sweet slider rolls for this recipe because I think they provide a great complement to the beef and horseradish flavors. Located in Eau Claire, Wisconsin, this family-owned and operated farm has been producing horseradish since it was founded in 1929 by Ellis Huntsinger! Huntsinger Farms, Inc. which grows the horseradish, produces it on a 5 and 7-year rotation with corn, soybeans, snap beans and other forage on over 9,000 acres of land. The farms and Silver Spring Foods are now run by Ellis Huntsinger’s granddaughter and her two sons. The business has been family-owned and operated for over 80 years and 4 generations. The horseradish is planted and harvested in the spring and fall seasons. The horseradish roots are then placed in cold storage until they are used to create prepared horseradish products. Now let’s get started with assembling these DELICIOUS steak and cheese sliders for your family to enjoy during a game or to bring to a tailgate party! As mentioned above, I like to use sweet rolls for this recipe and you will generally find them in sheets of 12, so grab 2 packs to fill your 9 x 13 pan. Next, preheat the oven to 350°. I use parchment paper to line the disposable pan so that the bottom of the sliders don’t stick to the pan and don’t get soggy. 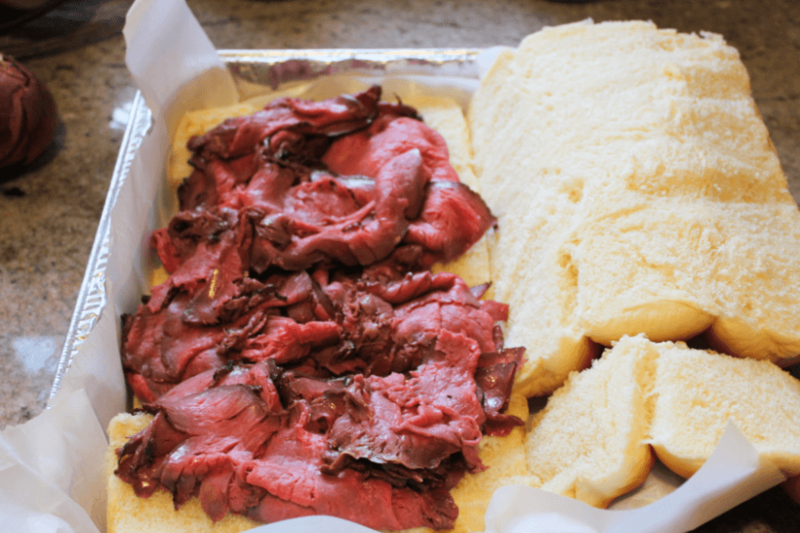 Slice the slider rolls in half then start placing your deli London broil evenly over the bottom half of the rolls. Next, you will layer the provolone cheese over the meat–folding slices in half when you need to! When the meat and cheese layers are done, you will caramelize the onions and layer those on top. I like to deglaze the pan with some red wine vinegar (and a dash of sugar if you like). Cover the sliders with foil and then place in the oven for 8-10 minutes. Let them cool and then use a knife to separate the individual sliders and serve with Silver Spring Applewood Smoke Flavor horseradish sauce. You can also add some fresh green butter lettuce for crunch and to balance the heat of the horseradish! 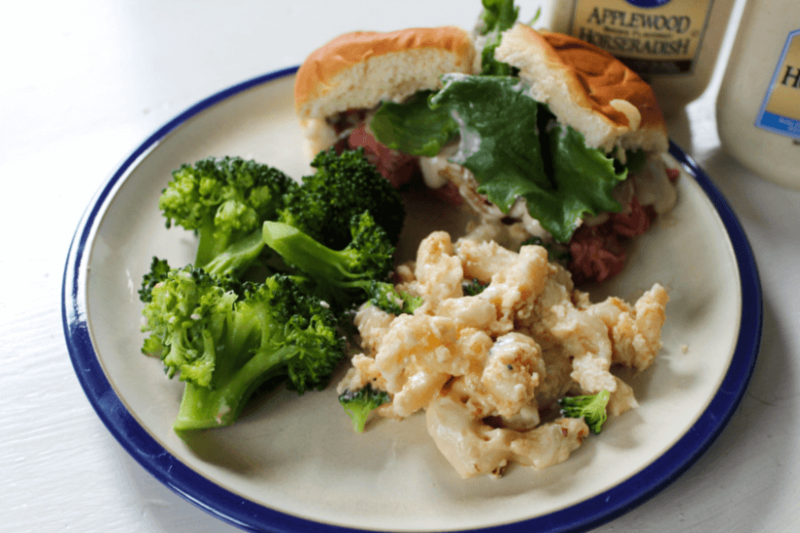 Serve with Silver Spring Applewood Smoke Flavor horseradish to taste and enjoy! To find out where you can purchase Silver Spring Foods horseradish products click HERE. You can also find them on Facebook, Pinterest, and Instagram. 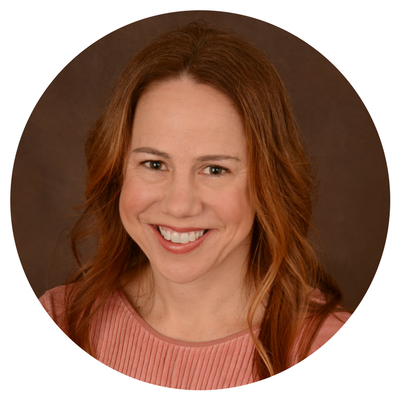 Previous Post: « Are We Sending Our Kids the Right Message?